So, Birmingham fans, take a look at the league table now - you're top of the Championship for the time being! On a more serious note, Gary Rowett will be rightly pleased with his side's showing today. For Burnley, it is two draws from their first two league games and the wait for a first home win since 14 March goes on - but it could have been worse for them today. Thanks for joining us for this game and all the best for the rest of your weekend. "I got the ball in the box and, you get told, if you get a slight touch, go down. I believe it was a penalty. "Coming here is a difficult place. To be leading twice in the game, we'd have thought we'd be able to keep hold of the lead but Burnley are a strong side and it was a great free-kick as well, to get a point for their team. "We're happy. We've been on the up since last season and we wanted to keep that momentum going. We're disappointed to come away with a point and that just shows how far we've come." "It was lovely to see it fly in. I'm just disappointed that we couldn't go on and win the game. "We were 2-1 down and (it was) a vital goal. It just wasn't quite our day today. "We made a couple of errors defensively, and they scored a couple of goals, but we showed good character to come back and get a point." Well, that was a pretty good second half, wasn't it? Burnley took full advantage of two set-pieces to come back twice and earn a point and their second goal from Matt Taylor is well worth a watch. Birmingham will be disappointed not to have held on to the win but, on reflection, I imagine they will be pleased with a point. Not many teams will be expecting a win at Turf Moor this season. The referee blows and it ends 2-2 here. Burnley will take that, having been behind twice. Birmingham's David Davis shoots left-footed but it is ambitious and goes well wide. Are we headed for a draw here? Burnley have a corner here in stoppage time. Tomasz Kuszczak comes to claim it but doesn't get there and it goes behind for another corner, but this time the referee spots a foul and Birmingham can breathe a sigh of relief. Burnley's George Boyd drags a half-chance wide. The hosts look the more likely team to steal the points here, late on. Jacques Maghoma comes on for Birmingham's Demarai Gray. Maghoma netted for the Blues on Tuesday in their Capital One Cup victory at Bristol Rovers. Meanwhile, five minutes of stoppage time have been indicated. Matt Taylor snaps a shot wide but the real chance fell to Marvin Sordell, who simply wanted too much time inside the penalty area. That was a real opportunity for the hosts. Burnley's Scott Arfield is booked for handball. Birmingham may have led twice but I sense they would definitely take a draw from here now, as that defensive substitution suggests. Marvin Sordell replaces Lukas Jutkiewicz for Burnley and Birmingham's David Cotterill comes off, to be replaced by Paul Robinson. Ben Mee drills across the six-yard box but nobody can get a touch on his cut-back. Burnley want a winner here and they are building up the pressure. His first free-kick hit the wall but his second is absolutely inch-perfect! Matt Taylor draws Burnley level with an unstoppable free-kick that goes in off the underside of the bar. Game on. Matt Taylor's first touch sees his free-kick strike a Birmingham wall. Can the former Portsmouth midfielder be the man to rescue a result for Burnley here? Jonathan Spector is booked for holding onto Burnley striker Lukas Jutkiewicz. Meanwhile, the hosts make a substitution, with Matt Taylor replacing Michael Kightly. Burnley's Scott Arfield skies wide from outside the box, and they are getting more and more frustrated here. Defensive midfielder David Davis comes on for Birmingham's opening goalscorer, Jon Toral. That's a switch to a more conservative 4-5-1 from Gary Rowett. George Boyd does brilliantly down the Burnley right and Tendayi Dawikya overlaps and plays a low ball across the six-yard box but noone can get on the end of it for the hosts. Birmingham striker Clayton Donaldson receives treatment for what appears to be a knock to this shoulder. Play resumes and he comes back on. Birmingham keeper Tomasz Kuszczak gets two hands to a Michael Keane header from a Burnley corner, and it was a relatively comfortable save. Burnley, having got themselves back into the game after the break, now need to do the hard work once again. Birmingham defender Jonathan Grounds' shot is blocked, as he tried to shoot through a crowd of players, but he was unmarked and that will worry Burnley. Sam Vokes comes on to replace Jelle Vossen. Vokes netted for Burnley last weekend at Leeds - can he now get them back into this match too? Ben Mee gets the first yellow card of the day for a cynical, late clip on David Cotterill. That was a tad unnecessary. Paul Caddis steps up and drills his penalty straight down the middle. Birmingham are back in the lead. A classic counter attack from the away side - and Birmingham City have a penalty. Striker Clayton Donaldson latches on to a perfectly weighted pass from Jon Toral, moves into the penalty area and is clipped from behind as he looked to turn away from goal. Soft, or just needless? Birmingham win a free-kick as Michael Kightly clips David Cotterill, for another soft foul. Cotterill's delivery in dangerous, as is Demarai Gray's subsequent cross, but both are cleared by the hosts. Michael Morrison gets a foot in to block a Lukas Jutkiewicz shot, as the game begins to stretch. Burnley are forcing a bit of pressure here. From a corner, Blues keeper Tomasz Kuszczak flaps but the ball goes over for a goal kick. Birmingham need to settle down a bit here. Scott Arfield drives a right-footed shot just high and wide from about 25 yards out. This is much better from Burnley. At the other end, Clayton Donaldson forces a save out of Tom Heaton. This game suddenly has a lot more urgency about it. Burnley are level and Birmingham will be disappointed with that defending. David Cotterill gives away a soft free-kick near the corner flag. It's whipped in by Michael Kightly and then flicked on to the far post by Jelle Vossen, where Michael Keane arrives to head in, much to the relief of the home fans. Birmingham's Maikel Kieftenbeld volleys a yard or so wide after good build-up play between Clayton Donaldson and Demarai Gray. Burnley keeper Tom Heaton seemed a little uncertain where that was going, initially. In all honestly, we didn't see too much from Burnley's summer signing from Genk, Jelle Vossen, up front, before the break. Can he make a mark on his home debut? Or will Sean Dyche pursue other options? Birmingham get us going again, this time kicking towards their travelling fans. Neither side have made any changes at the break. After their good finish to 2014-15, Birmingham are now 45 minutes away from a fifth-consecutive league win. Burnley will need to turn things around quickly if they are going to pick up a first home victory since 14 March. Turf Moor expects. Now what have Sean Dyche's team got up their sleeve in this second half? Do league tables even matter at this time of the year? I reckon they do if you're at the top of it. And, as things stand, that's exactly where Birmingham City are. Are you a worried Claret, or an over-excited Bluenose? Either way, you can get involved this afternoon by using #bbcfootball on Twitter. How do you see the second half going? So, as first impressions go, Arsenal youngster Jon Toral is certainly making a good one so far, on loan at Birmingham. After scoring what proved to be the match-winner on his Blues debut last weekend, he now has a second goal for the club and it is his sweet, left-footed strike that sees Birmingham lead Burnley at the break today. That's the end of the first 45 minutes and Birmingham deservedly lead at Turf Moor. We expect better things from Burnley after the break. We're playing two minutes of added time at the end of the first half and Burnley remain frustrated so far. Lukas Jutkiewicz rises to head Michael Duff's diagonal ball over the bar. He perhaps should have hit the target, but it was only a half-chance for Burnley at most. Tom Heaton pulls off a fine save to tip a Stephen Gleeson volley over the bar. He hit that from way, way out and it appeared to be dipping under the crossbar. Lukas Jutkiewicz shows good technique to swivel in the box and volley an effort towards goal but fortunately for Birmingham it goes straight at Tomasz Kuszczak. That's Burnley's best opening for about 20 minutes or so. I think 'solid' would be the best way to describe Birmingham over the last 10 to 15 minutes. They look like they are playing without any pressure, while Burnley perhaps have the burden of expectation, in this their first home game back in the Championship. Again, that was good play from Blues, calm, keeping the ball in good areas. Jonathan Grounds found himself inside there and it was a good little ball to Cotterill, who was unlucky. David Cotterill almost makes it two for Birmingham as he is given time and space to curl a left-footed effort onto the post. Tom Heaton looked beaten there. That is a let-off for Burnley. The atmosphere has gone rather quiet at Turf Moor and that's exactly what Birmingham will have been hoping for in this first half. Clayton Donaldson chests the ball down for David Cotterill but the winger's half-volley flies high and wide. Birmingham enjoy a lengthy spell of possession in the Burnley half and the home fans don't like this. The Blues have settled down now and look comfortable on the ball. Burnley are showing glimpses that they will be very dangerous in this game if Blues allow them any room. Birmingham goalkeeper Tomasz Kuszczak punches clear from a dangerous ball into the box, as Burnley search for an equaliser. Things haven't quite clicked for the hosts yet going forward, but we know they have got plenty of quality in the final third. At the other end, Birmingham win themselves a corner, which drops for Demarai Gray inside the area but his volley goes wide. That was a half-chance for the visitors. Already, Jon Toral has had a much bigger influence here than he did during the first game against Reading last weekend. Burnley have responded pretty well to going behind and have now forced a corner. Birmingham clear the danger but they look a tad nervous at the back so far. Burnley have a chance to level almost immediately but George Boyd's left-footed, bouncing shot is palmed away by Tomasz Kuszczak and Lukas Jutkiewicz's rebound goes straight at the Birmingham keeper. Birmingham lead and it is a simple, simple goal. From a long clearance from Tomasz Kuszczak, Clayton Donaldson knocks the ball down for Jon Toral who strikes it hard and low, left-footed into the bottom corner. That's some start for the visitors, who are ahead with their first shot on goal. Burnley are unhappy as Lukas Jutkiewicz goes down in the box under pressure from Jonathan Spector as a deep cross arrives in the box, but the referee seems satisfied there was nothing in it. While we still await the first effort on goal here, it's worth mentioning that Birmingham, despite winning last weekend, had the fewest attempts on goal of any team in the Championship, with just five shots. They seem content to sit deep for the time being today, as Burnley enjoy some early, calm possession. It has to be said there are a fair number of empty seats around the ground today, as Burnley adjust to life back in the second tier. Birmingham, playing in their traditional blue and white kit, have brought a reasonable number of fans up the M6 today. We are under way at Turf Moor as Burnley kick things off. The hosts are attacking towards the Birmingham fans in this first half. knocked out of the Capital One Cup by lower-league opposition certainly won't have been what Sean Dyche had in mind for Burnley's first week back in the Football League. Now can they get their first win of the season in front of an expectant home crowd, or will visitors Birmingham make it three wins out of three so far this term? We're about to find out as kick-off approaches, on a cloudy but dry afternoon at Turf Moor. As always, you can get involved this afternoon by using #bbcfootball on Twitter. Which set of colours will be celebrating by the time 14:30 BST swings around - Blues or Clarets? beat Reading 2-1 last Saturday. Young forward Jon Toral, on loan from Arsenal, starts after scoring on his Blues debut against the Royals. There is also a start for Michael Morrison, despite slight fears he may have suffered a minor hamstring pull in midweek. Burnley have named the same starting XI that drew 1-1 away at Leeds on the opening weekend. The only change to their bench today, from that match, sees Joe Jackson come in for Cameron Dummigan. The good news for the Clarets is that defender Michael Keane starts after missing Tuesday's League Cup loss at Port Vale with a hamstring strain. German striker Rouwen Hennings, who joined the Clarets for an undisclosed fee on Friday, is still awaiting international clearance, so is not available. 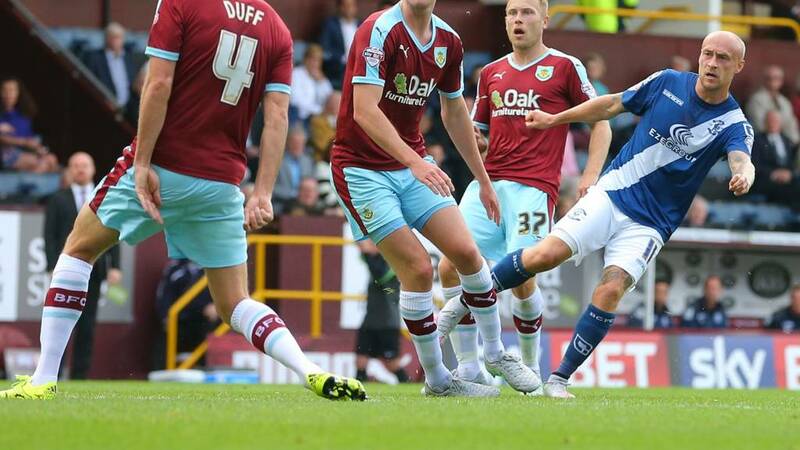 This Saturday lunchtime Burnley face Birmingham City at Turf Moor, with the hosts looking for their first win of the season after relegation from Premier League in May. 3-3 draw at St Andrews. Since then, Burnley have gone up to the Premier League and come back down again, while Birmingham survived relegation by the skin of their teeth before enjoying something of a revival under new boss Gary Rowett last term. It's like it was never away, right? Now, what does the second weekend of 2015-16 have in store for us? Welcome to our live text coverage of Burnley v Birmingham City in the Championship.